Essential Fatty Acid Deficiency: Cause Of Your Weight Loss Resistance? 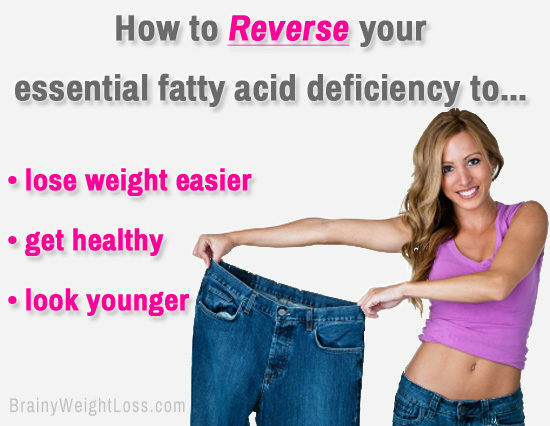 You will find here practical solutions to reverse your essential fatty acid deficiency and its dire effects on your health and body weight. Since knowledge is power, this information empowers you to do some simple things to eliminate (or avoid) the health issues linked to insufficient amounts of fatty acids in your diet. What are essential fatty acids, you ask? They are unsaturated fats essential to our health. They make up our body’s cell membranes, help hormone production and absorption of certain vitamins, provide us with energy. Because, while our body can synthesize most of its needed fatty acids, there are two types that can’t be synthesized, therefore we must get them from food or supplements. The first type is linoleic acid, or omega-6 fatty acid. The second type is alpha-linolenic acid, or omega-3 fatty acid; this is then converted in the body into the active forms of omega-3s that you’re probably more familiar with: EPA – eicosapentaenoic acid – and DHA – docosahexaenoic acid. Yeah, I know… ignore those mouthfuls; it’s enough to remember just EPA, DHA, omega-3s and omega-6 fatty acids. Why is this topic important – even vital – for you? Well, because that long-touted “low fat diet” mantra pushed over and over at us has caused a lot of people to stay away from any kind of fat. Over time, this low-fat obsession has generated a plethora of serious health issues – beyond just the annoying weight loss resistance. You may have heard your grandparents speaking of being given fish oil by the spoon as children… Well, that was just old wisdom at play. The need to get healthy fats in our diet is not a secret. For years, independent researchers and nutritionists have warned us about the mistake of avoiding certain fats, regardless whether on a weight loss diet or not. You’ll see how to avoid an essential fatty acid deficiency in a moment. Before this however, take a look at Dr. Erasmus’s eye-opening video about the widespread and scary consequences of this serious nutritional deficiency… You’ll discover why this has created a nation of obese and unhealthy “heart-attacks-in-waiting”. For more on Dr. Erasmus’s work, visit UdoErasmus.com, which provides a wealth of much-needed education on the “right fats diet” vs. the popular, but incredibly deceiving low fat diets. And if you’re up for a long-winded scientific paper read, The National Institutes of Health website provides a lot of supporting research on the clinical uses of omega 3 fatty acids for the health problems listed above, although it only highlights fish oil as a rich source of omega-3s, and not the latest research showing that krill oil is, in fact, superior. You may consider taking the following three supplements – always buy the best quality you can get because all three are oils that go rancid easily if not manufactured according to the highest standards. Like with any other dietary supplement, you should consult your healthcare provider before taking it – especially if you are pregnant, nursing, taking medications, have a medical condition, or have known adverse reactions or allergies. If you decide not to supplement your diet with essential fatty acids, at the very least try to include as many vital omega 3 healthy fats in your diet to avoid weight loss resistance and a dangerous essential fatty acid deficiency – here are the best omega 3 sources available in common foods.